I have another award waiting for you on my blog! The Beautiful Blog Award. Brigit, when you have a moment, drop over to my blog. I have an award waiting there for you too! Thanks so much for your inspiring blog! Thank you for this award. I am honored that you chose me. 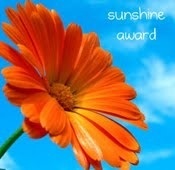 Thank you for the Sunshine Award Brigit! I am so excited!